First Financial has been notified that some of our members’ Debit and Credit Cards used at Kmart between September 3, 2016 and April 30, 2017 may be at risk. View the entire alert message from Kmart here. If you visited Kmart during this time period and used a First Financial card, we urge you to monitor your First Financial account. If you would like, please visit a branch location to replace your debit card, or contact our Member Relationship Center at 732.312.1500 to have a new Debit Card ordered. If you used a First Financial credit card, please call 866.820.3808 to receive a replacement card. Enroll your First Financial Debit/Credit Cards in Visa Purchase Alerts – you’ll get an email each time your Debit Card is used over an amount you set, when your card is used outside the country, or when your card is used to make a purchase online or over the phone. Credit Cardholders also have the additional option of adding a text alert, this can be set-up in Online Banking under your Credit Card account (select the Communications tab and then Visa Transaction Alerts). As always, First Financial continues to monitor our member accounts for suspicious activity. If you have any additional questions or concerns, please give us a call at 732.312.1500 or email us at info@firstffcu.com. Debit vs Credit Cards: Which is safer to swipe? During a data breach where fraudulent transactions occur, debit card users could face much bigger headaches than credit card users. That’s because debit and credit cards are treated differently by consumer protection laws. Under federal law, your personal liability for fraudulent charges on a credit card can’t exceed $50. But if a fraudster uses your debit card, you could be liable for $500 or more, depending on how quickly you report it. “I know people love their debit cards. But man oh man, they are loaded with holes when it comes to fraud,” said John Ulzheimer, credit expert at CreditSesame.com, a credit management website. Plus, if someone uses your credit card, the charge is often credited back to your account immediately after it’s reported, Ulzheimer said. Yet, if a crook uses your debit card, not only can they drain your bank account, but it can take up to two weeks for the financial institution to investigate the fraud and reimburse your account. “In the meantime, you might have to pay your rent, your utilities and other bills,” said Beth Givens, director of the Privacy Rights Clearinghouse. The organization recommends that consumers stick to credit cards as much as possible. Whichever card you decide to swipe, here are ways to protect yourself from scammers. Be vigilant with your accounts: The Target hack is just the latest in a long history of data breaches, and it likely won’t be the last. As a result, you should check your debit and credit account activity at least every few days and keep an eye out for any unfamiliar transactions. If you notice anything fishy, notify your financial instituion or credit card company immediately. Set your own fraud controls: Financial institutions have their own internal fraud controls, but some transactions can slip through the cracks, said Al Pascual, senior analyst of security risk and fraud at Javelin Strategy & Research. Many financial institutions will let you set alerts for account transactions. Even better, some allow you to block transactions that are out of the ordinary for you, such as for online purchases at a certain kind of retailer or for any purchases over $500. “We believe that consumers are going to know best as to how to protect their account,” he said. “They know their own behaviors. Watch out for fraud hotspots: You should be especially wary of using a debit card online and at retailers more vulnerable to fraud. Gas stations and ATMs are hotspots for so-called “skimmers,” or machines that scammers install to capture your card information. Watch out for ATM parts that look unusual and always cover your hand when typing your PIN in case a camera is watching, said Shirley Inscoe, a senior analyst with the Aite Group. Don’t let your guard down: If you think your information has been compromised, don’t assume everything’s fine after a few months. 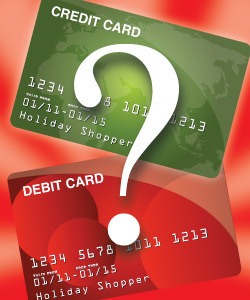 Stolen card information is often sold to a variety of groups on the black market who may hold onto it for months or even years. If you fall victim to ID Theft, don’t panic – First Financial is here to help! Report the incident regarding any of your First Financial accounts immediately, by calling us at 732.312.1500 or emailing info@firstffcu.com. *Article by Melanie Hicken of Yahoo Finance – click here to view the article source.